After an entertaining discussion at BarCamp Berkshire about video games, I decided to treat myself to an Xbox 360. After several happy years with a Nintendo Wii, I was keen to see what the new state of the art was. I picked the current top pick console and, I must say, while the games are great the console is somewhat of a disappointment. 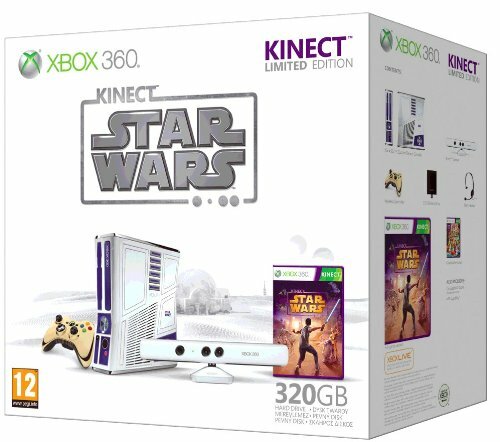 I picked the limited edition Xbox 360 320GB Star Wars Kinect Console with Kinect Star Wars - Limited Edition (Xbox 360) . It comes with a 320GB hard disk, a Kinect, optical audio, HDMI port, fully tricked out - and a composite video cable! I was bemused when looking through the packaging. This is meant to be a flagship console, and yet it's expected that I'll show this off on my huge TV via a crappy little low-resolution cable? A bog standard HDMI cable is a quid! Why not throw one in the box? Same with an optical cable, the console has delicious 5.1 surround sound - and yet the console comes with only a stereo cable. It's an odd blemish on an otherwise fine bit of hardware. The controllers are also odd. I had naively expected that they would charge via USB. The console has an abundance of USB ports, so surely the Xbox controllers - like those of the PlayStation - can be charged via them? Well, yes and no. The controllers don't come with a rechargeable battery pack. Although Microsoft very generously provides a couple of cheap AA batteries. There is a charging port on the controller - but it's not a standard USB recepticle. It's a weird proprietary port. This is typical Microsoft - make things slightly inconvenient for the user in the hope that they'll buy an overpriced accessory. The controller could have so easily come with a built-in battery pack and charged via a normal micro-USB socket. So, after wiring the whole thing up, what are the first impressions of using the Xbox dashboard? What. A. Mess! I'm sure that if you've been using the 360 since launch it all seems familiar - but there are just so many options! I know that it's more than just a games console - but there's such a jumble of ideas that the whole effect is one of confusion. Actually, the first thing I noticed was that my home screen was playing an advert! I've just spent over three hundred quid on this, and you're showing me adverts? Adverts which when accidentally selected scream out at high volume? Not cool. It's dominated by a huge advert compelling me to upgrade my experience (because the default isn't any good, I presume) then two adverts on the right. Sidelined on the left are things I actually want to do - play the games that I've purchased. Yes, please do alert me to new things I can do - but does it have to be this crude? There appears to be no way to customise the dashboard. I want my homescreen to have quick links to iPlayer, my downloaded games, and whatever's in the drive. That's not possible. It's almost Apple like in its insistence that This Is The One True Way. Very frustrating. That extract from The Hitchhiker's Guide To The Galaxy is scarily accurate. I can be sitting watching a programme on iPlayer, shift my body a little and the Kinect wakes up and asks me to wave at it - using an annoying little graphic in the corner of the screen. I just wish there was a way to turn it off when not in use. Oh, one last word on the iPlayer - the Xbox 360 doesn't adjust its refresh rate to match the playback rate of material. So you get 25fps showing at 60fps which causes all manner of weird jerkiness. Most unpleasant. I'm properly loving Portal 2 - the other games are also fantastic. There are just three flies in the ointment. First is the loading times. On my Wii, I've ripped all the games to a USB hard disk. The load times are virtually gone, no waiting between levels, or anything like that. I had assumed that with the Xbox's huge internal hard drive, the majority of games would take advantage of being able to cache their content. That doesn't seem to be the case. Games take ages to load from DVD. Even the downloaded games, like the ridiculously fun Fez, make me wait for a chuntering drive. I almost wish that the 360 came with an SSD rather than the lump of spinning metal it uses for storage. Secondly, there's the issue of updates. The first time I switched on the console it wanted to connect to the mothership and update its software. Which it did. Twice. Every game I slip into it interrupts my first play experience with "This game needs to be updated NOW!" I understand why updates are needed - but it's really disruptive and doesn't create a great first impression. So, I've set up a GamerTag for myself. My wife has also created some kind of Xbox account. How easy is it to start a co-operative game of Portal 2? Oh, another loading screen. Still, good to know who owns the copyright for these things. That'll improve my gameplay experience. Yes! We're in the games and ready to... oh! No. My mistake. Still waiting to load. What the bloody hell is this? Not once in setting up my Xbox have I ever been asked to set a cloud storage device. I've no idea what it is, or why I would want one. Worst still, there's no "remember my selection" so I have to see this pointless screen every time I want to play. The hard disk is not a speed demon. I'm sure it helps keep the console cool & quiet - but it means yet another loading screen for me to sit patiently through. Now I can select the sort of game I want to play. Fine, have this as a sub menu, rather than on the main screen. Whatever. Click. Yes. Yes. Splitscreen. No, please don't give me some way to remember my preferences, that would be far too convenient. Hang on! I don't have a premium subscription - why are you even offering me online play? Now I have to find my second controller. That's my fault for leaving it in the bathroom though (don't ask). The sign in process for the second player is fairly pedestrian, but a bit long winded. No, have to absolutely super-duper confirm that was the profile I intended to select. Nyagh! Another of these bloody cloud things! No no no! Go away, just save on the HDD forever and NEVER ASK ME AGAIN! We are exhausted at this point and the 360 allows us to take a nap while it access its memory banks. Oooh! A different loading screen! Wha? But? I...? Is this it? YES! After sixteen hours of setting up, we're finally ready to play. In seriousness, it's a dozen button presses, and about 3 minutes of my time wasted. It's not a huge amount in the grand scheme of things - but it's a continual annoyance. I'm being deliberately nit-picky. I love the console (and the R2-D2 sounds whenever it's switched on). The games are such good fun, and the Kinect is a marvel. But... But... The overall feel really disappoints and confuses me. Is this a games console, or a video player? It mashes the two together in an uncomfortable way. The Metro UI looks lovely - as it always does - but highlights its shortcomings by having dozens of sub-menus to plough through. It's an expensive bit of kit - yet it's slathered in adverts which, to my mind, reduces its premium feel. I've not yet tried my free month of Xbox Live Gold Membership - at this point, it just feels like it would be another long download and offer very little in return. It seems odd that I can only pay for movies if I've already paid my monthly membership fee. I can download games without paying. And why can I watch iPlayer without subscribing to Gold, when trying to watch 4oD requires the premium subscription? All very inconsistent and hard to understand. I can customise my avatar - and even pay for the privilege of wearing a branded T-Shirt - yet I cannot customise my dashboard to suit my needs. That, I think, is the root of the problem. Parts of the 360 feel like it has been designed for Microsoft's benefit; not mine.